It was a “good news, bad news” kind of weekend for the Oregon lacrosse side. 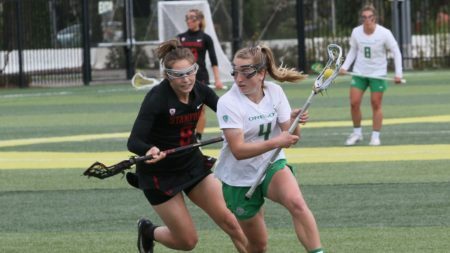 The Ducks picked up their first Pac-12 victory with a 12-8 win over California (6-9, 3-5) Friday evening at Pape` Field but fell to 18th-ranked Stanford 18-12 on Sunday afternoon. Despite being out-shot 30-22, defensively Oregon held the Bears to 1-8 on free position shots while Claire Domshick’s hat trick paced the Duck attack. Keeper Rachel Hall was credited with a dozen saves in picking up her third win of the year. The 18th-ranked Cardinal scored the game’s first four goals to open Sunday’s match and though Oregon rallied back with three of their own to close within a goal at 4-3, Stanford (11-4, 6-3) netted 10 of the next 12 goals to put the game out of reach. The Ducks (3-13, 1-8) will conclude the regular season hosting Colorado on Friday, April 19th beginning at 7:00 pm. Oregon will also host the conference tournament at Pape` Field starting Thursday, April 25th.